Are a Surfer’s Paradise and a significant emphasis on culture mutually compatible? Australia’s City of Gold Coast thinks so, as evidenced by its ambitious competition for a new cultural precinct. The site of the Cultural Precinct competition is the Evandale district, separated by a river and Chevron Island from the city’s premier attraction—Surfer’s Paradise. As indicated by the latter’s name, the city has gained a large share of its revenue as a tourist attraction. Outside of the inviting coastline, there is much to supplement the entertainment needs of tourists, including 40 golf courses and five theme parks. But as Australia’s fastest growing city—now at almost 600,000—the focus has now turned to the arts as a major asset. 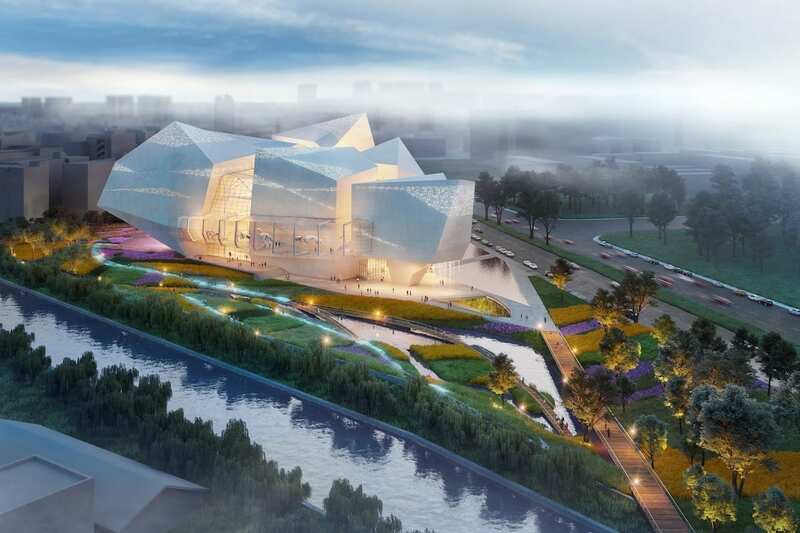 The city already has a performing arts center and film theater on the site; but the new plan envisions adding a brand new art museum and amphitheater. All this will necessitate some major changes in the built fabric, including the removal of a present, outdated government administrative building—to be moved to an adjoining neighborhood location across the water to the west. The City Council Chambers will be retained at the present location, since the quality and footprint of this more recent structure indicate that it is not an obstacle to intended development. 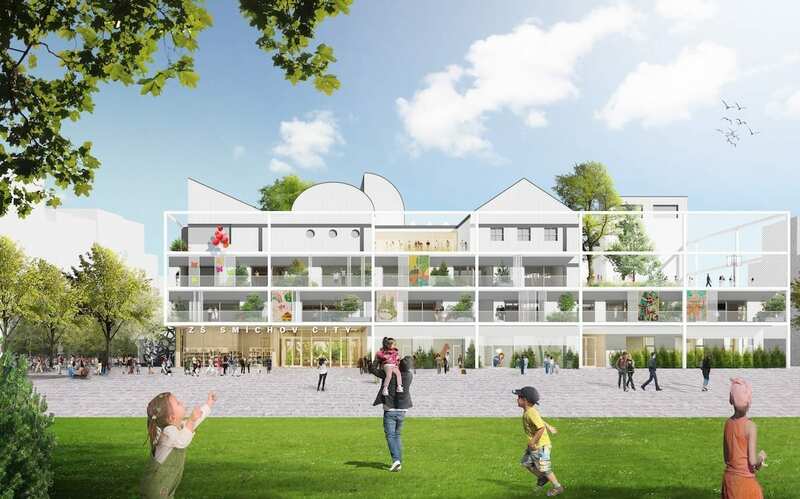 To create a more attractive park environment, it is assumed that the large surface parking area, which covers almost half of the site, will be removed and accommodated below grade. Also, improved bus service and a new bridge to Chevron Island should facilitate more accessibility from the east and Surfer’s Paradise. Aside from the above challenges, competitors were to indicate that their projects can be built in phases and within budget. commissioned for intensive exploration and presentation of ideas and possibilities for the cultural precinct. Stage Two asked that the competitors present designs “that represent a substantial cross-disciplinary design investment.” Competitors were expected to respond to Stage One with a full understanding of the overall competition ambition as outlined in the brief. Most importantly, the client stated, “Stage One Submitted Designs are expected to be only high-level and indicative, with depth and detailed definition to come in Stage Two.” The client also stated that the three Stage Two finalists would each receive AUD225,000 for their work. • Michael Sorkin, author and editor of 15 books on architecture, Principal, Michael Sorkin Studio and Director of the Graduate Program in Urban Design at The City College of New York. • John Kotzas, Chief Executive of the Queensland Performing Arts Centre, Brisbane. Playful and inclusive, ARM Architecture’s winning design promises to entice residents and visitors to experience and participate in a new platform for the Gold Coast’s rich and distinctive arts and cultural life. ARM presents a design, which embraces the city’s egalitarian and celebratory character while cleverly addressing the city’s evolving cultural facility needs. It adopts the dynamic and generative principles of a voronoi diagram, to establish a distinctive and memorable pattern language. This web-like theme recognizes that the evolution of the Gold Coast Cultural Precinct will not be a single project that develops in one swoop, but a series of progressive stages encompassing adaptive reuse of existing assets as well as the construction of new facilities which will be brought together over time. This pattern – its DNA – organizes and connects elements across the entire Cultural Precinct. It creates a delightful, lyrical landscape of soft and built forms that vary in scale from the grand and voluminous to the modest and intimate, capturing the Gold Coast’s playful and energetic spirit and allowing for a diversity of experiences, from opera to skateboarding, contemporary art, fashion and design and cinema. A quirky, twisting 12-storey New Arts Museum will rise from the landscape as a beacon of Gold Coast arts and culture. An exterior walkway spirals up the building to a roof lounge with panoramic views of the wider Gold Coast landscape from the hinterland to the sea. This tower form will be unique and distinctive among art museums worldwide, offering visitors many ways to both physically and emotionally connect with the artworks on display. 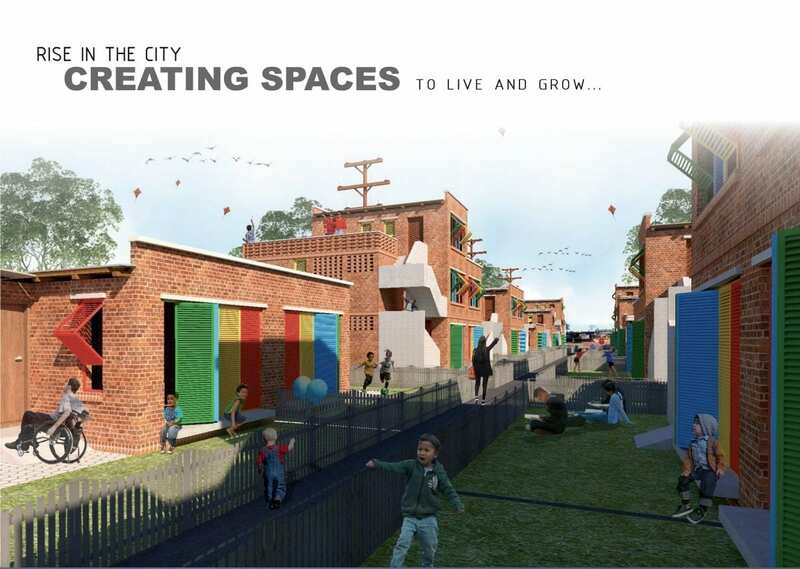 It will also help to liberate ground space contributing to a net increase of open green and waterplay spaces throughout the precinct. In turn, this outdoor Artscape is envisaged to grow into a world leading subtropical pleasure garden. 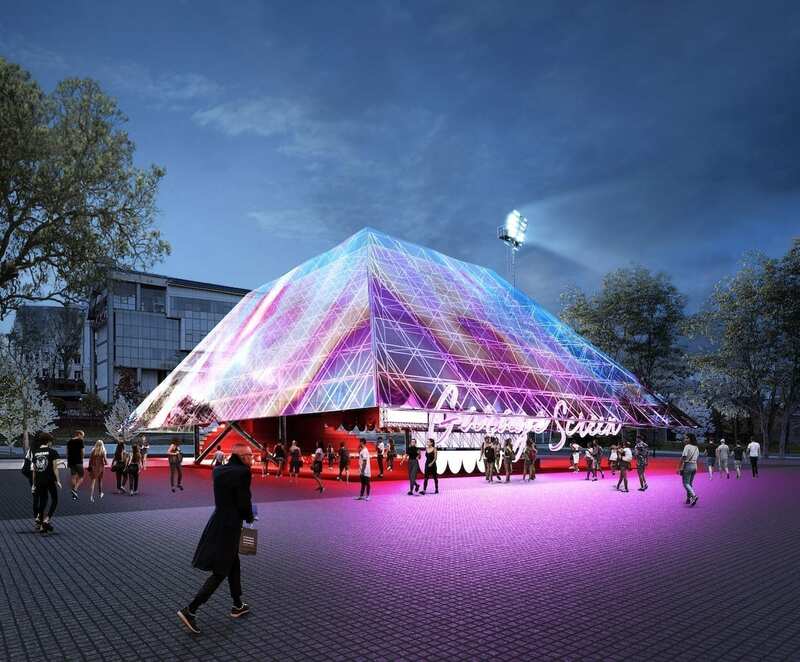 The existing Arts Centre building will be expanded and wrapped within a voronoi superstructure to create the new Living Arts Centre for performing arts and cinema. New facilities within will include a 1200-seat state-of-the-art theatre and a renovation of the existing theater. Centre stage on the site will be a large external amphitheatre that will provide a spectacular and effective outdoor venue. The concept blends playful possibilities of the landscape with more serious site-specific environmental solutions, with development a new watercourse and underground spaces that can be flooded; harvesting of energy by a variety of solar systems and water collection and re-use throughout the site. The design addresses the complex requirements of movement and circulation, managing separation of pedestrians, cars and service vehicles. Nikken Sekkei’s striking design reflects the ‘web of water’ which defines both the Gold Coast and surrounds the cultural precinct site. The web is incorporated, both dramatically and subtly, into the submission’s landscape and built forms. Most spectacularly, a grand ‘water stage’, with dimensions of 195.9m x 195.9m, celebrates the founding year of the Gold Coast in 1959. These twin references, of the city’s founding date and the ubiquitous presence of water – shimmering, flowing, falling – celebrate the site’s location and its coastal character. They come together in a bold and arresting landmark statement. Centrally located, the water stage links three landscape zones; nature park to the north, waterfront to the north east, and the civic field to the south west. A series of smaller landscapes are created as sub-divisions of these three primary zones, such as a rain forest, grass land, water garden and indigenous garden. Dual approaches from a Chevron Island green bridge deliver visitors either to ground-level or the elevated water stage. The five senses of sight, sound, touch, smell and taste are engaged across the site. The water stage doubles as a multi-purpose performance venue and promenade, offering arresting views of the city skyline and hinterland. Depth of water is cleverly controlled, ranging from only a few centimeters deep to dry, providing opportunities for small and large performance spaces to emerge. It also mirrors a typical ‘Queenslander’ roof, offering protective shade to the central amphitheatre below. Clustered around a central axis, CRAB/Vogt/DBI have assembled a village of fluid forms, ranging in scale from modest to monumental. This axis, defined as the great terrace, frames the view on arrival, of the river and city skyline and represents a beguiling and sculptural presence on the site. Structural volumes are carved out to create a series of vaults, arches and scooped out undercrofts. Apparent gravity-defying cantilevers thus created, serve the dual purpose of protecting visitors from the elements while creating a theatrical spatial setting for the heart of the Cultural Precinct. In the context of the Gold Coast, with its blue skies and deep shadows, these forms promise great potential to generate poetic, transient shadow plays on the surface of the buildings. Similarly, inspired deployment of real-time informatics and projections serve to transform the buildings into large-scale digital canvases, with particularly remarkable opportunities for dramatic night-time illumination. 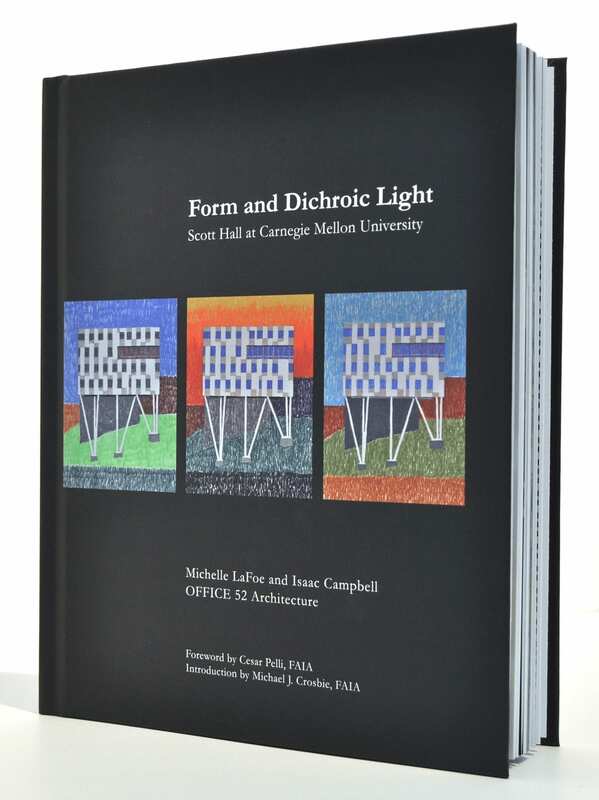 Alongside these large dominant forms, small and incidental buildings and shelters are proposed across and beyond the site, establishing a dynamic tension between large and small, formal and informal, institutional and ‘ad hoc’. This approach provides for the precinct’s potential staging and changing uses, and suggests rich potential for engagement with local creative communities. The design’s informal elements, including its ‘confetti of kiosks’ that appear dotted across to Surfers Paradise, provide opportunities for one-off and small scale participation by individual artists and creative producers. At the fulcrum of these built forms lies the Great Terrace, intended as a large, open-air room. To the east of the terrace is an open amphitheatre looking out to a water stage. To the west the terrace leads diagonally to the corner of Bundall Road and Crombie Avenue. A meandering river is introduced, delineating the core cultural precinct area from a zone for potential partnership development on adjacent land abutting Bundall Road. Many built assets are retained and a staged approach invests early in an arts walk from Surfers Paradise, linking up to the Artscape. COMPETITIONS: I assume you attended sessions during both stages of the competition, How long did they last? Michael Sorkin: I think they were both a couple of days each. At the second session there were presentations by the teams, which were long enough. It was very professionally and equitably organized. 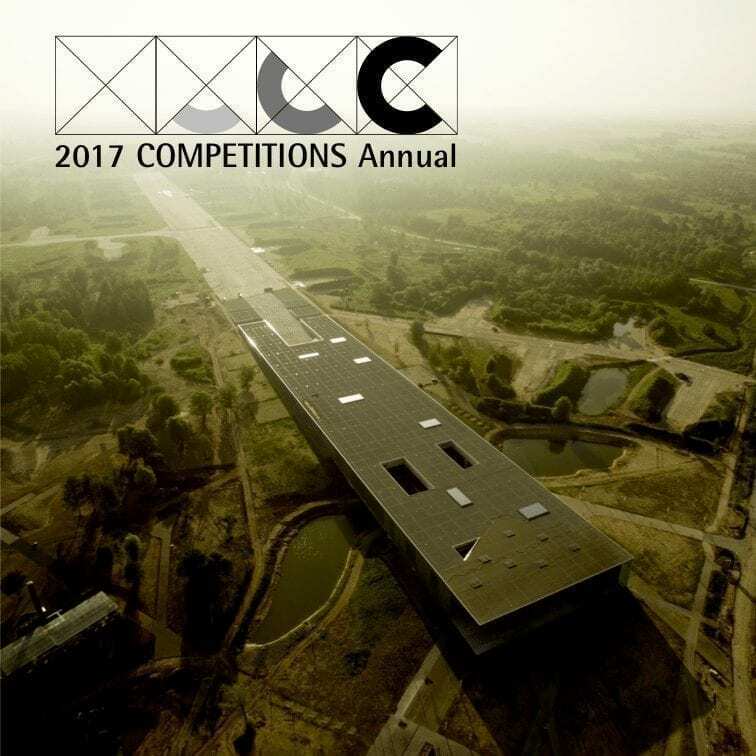 COMPETITIONS: Although the competition brief was only 29 pages, I thought it was one of the best documents of that type I have come across. MS: It was very succinct and well done. I have been involved with the people who were engaged in the organization of the competition before, and there was a very high level of competence. MS: It was a very congenial group. There was no violence, but there was a good discussion. Everybody was looking for a good outcome, and we did end up picking one of the most visionary schemes submitted. I would say that in terms of the way that the projects progressed from the shortlist to the final presentation, these people (the winner) did an extraordinary job. Theirs was the scheme that was the most thoroughly mature in that process. MS: It was a planning stage; but it was clear where they were going architecturally. It wasn’t just a site planning stage; there was a decided tectonic component. COMPETITIONS: In other words, the new art museum component as a high-rise was already there? MS: Their scheme did change from the first to the second stage with that tower; but the formal direction was clear from the first to the second stage. COMPETITIONS: All the schemes saw it necessary to put the parking underground. MS: Yes. And there were certainly planning issues having to do with the way you got across the water and back into the center of the town and the way in which the site adjoined a developing but not very attractive avenue to the west. There were low-density neighborhoods nearby; so there were plenty of important planning issues to engage. It was also clear from the get-go that they were looking for something with strong symbolic resonance to put the town on the map, other than a beach and bar scene. COMPETITIONS: But the city has grown very fast. It’s apparently the fastest growing city in Australia. MS: You’re in the middle of nowhere, and there are now skyscrapers, where forty years ago it was a two-story beach town. COMPETITIONS: Can you draw a comparison to other places, such as South Florida? MS: There is a little bit of that southern California, south Florida sensibility. But this is Australia, and it’s pretty laid back. Also, I think there is a fair amount of Asian money coming in, which is driving the real estate market to a certain degree. What I would cite was the very professional organization—the succinctness of the brief, the congeniality of the jury, and the mayor was there—at least for the first round. The ….. was open, and we picked a scheme, as things go in the architectural world, that was reasonably out there. Everybody was delighted with it, and it was a good environment in which to make decisions.